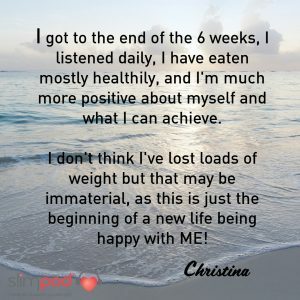 Some of my regular readers will know that I do a lot of work with Thinking Slimmer, helping out with social media, blogger outreach, moderating the Slimpod Club Facebook group and all sorts of things. 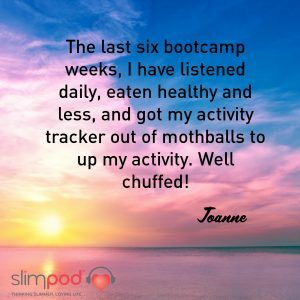 Of course, New Year is peak weight loss season, and so over the last six weeks, I have been helping Sandra run and moderate her six-week Slimpod weight loss boot camp. All the participants had to do was set their goals, listen to their pod for 10 minutes every day for six weeks, and record the little changes that happened to them, also sharing their progress in a Facebook group. 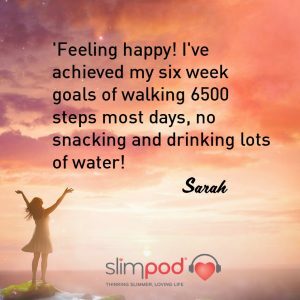 There is no set diet or weight loss advice with Slimpod – the pod retunes your subconscious mind so that you automatically eat more healthily, make better choices and move more, in a way which works with your lifestyle. It’s almost uncanny. So how did people get on? Quite a lot of people made it to the end of six weeks. They listened every day and noted their little positive habit changes. Many of them commented as they went along how different the process was to a diet, and how liberating it was that no food is forbidden and they were essentially eating “whatever they wanted” – the difference being of course that the Slimpod had subtly changed what they wanted, so they were making healthy choices naturally. Quite a few of them started exercising again, or ramped up what they were doing. many of them dusted off their step counters and aimed for 10,000 steps a day. By the end of six weeks, there were some lovely stories, which I just wanted to share with you. Even though I’m just the group moderator, helping people to find success stories like this makes my job so much more worthwhile. The great bit is that not all of the stories are just about weight loss. One of the things that Slimpod users are encouraged to do is take their mind off the scales, and instead focus on how their clothes feel and how they feel inside. And so many of them feel fabulous as a result of just 6 weeks, with increased body confidence and a sense of having achieved something amazing, which can springboard them to even greater success in the future. It’s lovely to see the realisation that you can be happy and accept yourself, even before you get to goal. Just knowing that you have changed some habits without willpower or effort is enough to make people smile. It’s a lovely feeling when you set a six week goal and achieve it! If you are inspired by these tales of weight loss and increased body confidence, then why don’t you head over to Thinking Slimmer and read their free weight loss ebook. If you fancy it, you could pick up a Slimpod for yourself, or if you are reading this in October 2018, then win one here. I didn’t participate in the boot camp myself this time, as I had a lot going on at home, and don’t always want to start a weight loss programme in January. Moderating the group was quite enough without participating as well! But I plan to do something similar between now and Easter – when you see how much people can change in six weeks – I want a piece of that positivity. 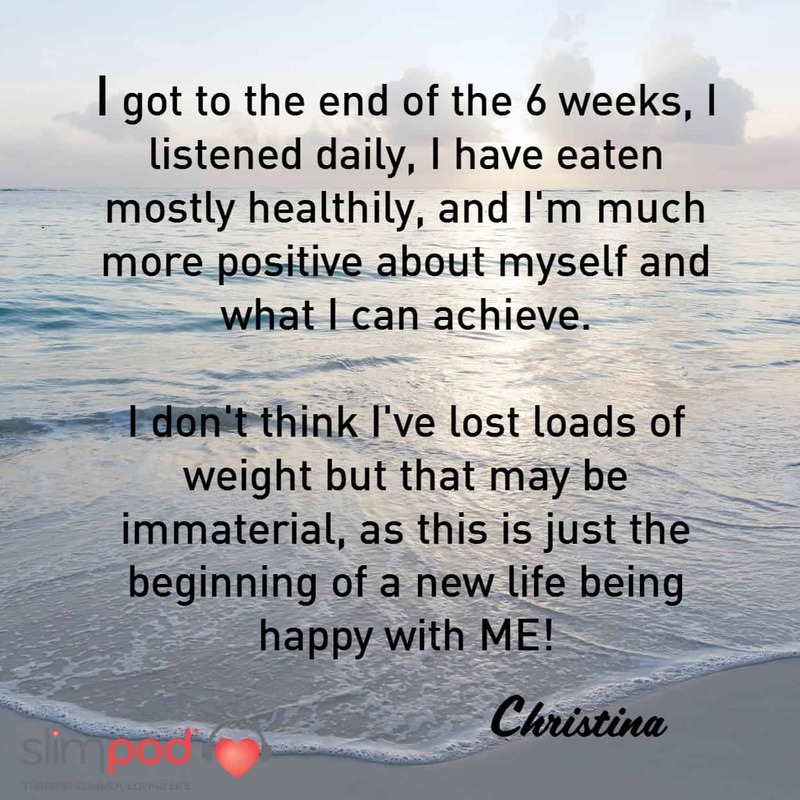 It would be lovely to see a few of you in Slimpod Club – if you do buy a pod as a result of seeing this article, please come and say hello to me in Slimpod Club and I’ll happily be your personal weight loss buddy. This post contains affiliate links. If you buy from Thinking Slimmer I will receive a commission, but I heartily endorse all of the products and have seen the benefits for myself.